Marist Asia Foundation recognises that so many Burmese Migrant Workers have stopped their education journey around 12 years of age to find work to support their families. Many work in fish factories. 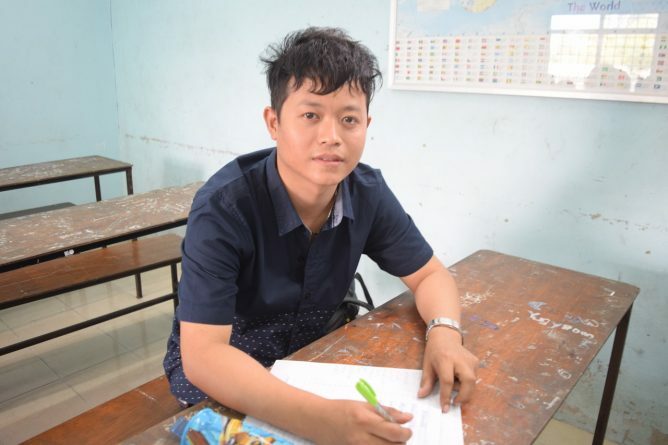 By providing Sunday Migrant Workers classes, giving life skills and Thai, English and Computer Classes they can have more choices beyond the fish factory in their future. I am Ma Thet Hnin Oo. I have been living and working in Ranong, Thailand for several years. I have been studying free English class once a week every Sunday in Marist Asia Foundation for 3 months already. Now, I am glad to see my improvement. Before I studied here, I could only read English alphabet. I have never dreamed that I had such a good chance to study English again in my life. It is so difficult to find this kind of study chance once a week while you are working here. Now, I am getting to know some fruit vocabularies in English. I start listening to English song and trying to read some English words on banner or on street and road. I think when we used to speak and learn English frequently, it is getting easier. I find it quite interesting and fun learning English. English is international use language to communicate and find information on internet. My co-workers find me quite funny when I practice my English with them but I don’t. I know that it’s a good way to practice your new language. I am inspired with the teachers who are teaching me in the class. I wish I could speak, read and write English fluently like them. I know that it takes long time to do it. I need to work hard for that. I am thankful to each one of people who involves in this program such as teachers, program donor and manager. I am Mg Wathan Ko Ko. Now, I am studying in Thai class. I am from Mon State, Myanmar. My parents left there. I have been living in Ranong, Thailand for a while. In the past, I had been worked in fish factory and I had studied Computer class at Marist Asia Foundation (MAF). Then, I lost the chance to continue to study because I had to work full time and I was so busy. Now, I quit from that job and am working in Phone shop. The reason I quit my previous job because I would like to study in Thai Class which is supported by MAF and could take day off every Sunday. they all could get a chance like I do. I also aim to share others back what I have learnt in my class. MAF gives this opportunity to our Burmese migrant workers and children who are indeed needed to be in classroom again is what a precious gift ever we have received. Now, people like me who are in classroom again can shine like a diamond in the sky because the supports from MAF, teachers and managers who run this program well. We will be always thankful and grateful to all who involved in this program. My name is Daw San New Oo. I am working as a head master of Lotus Pond Learning Centre in Ranong, Thailand. I have been working as a teacher in Ranong for 14 years. Nowadays is technology era, I think everyone should learn ITC skill. I am learning it so I can manage the school data, information, and accounting properly on computer. I can teach back to my students too. been learning properly from the basic and usage of computer by understanding, applying and also playing games. I have learnt the Hardware and software which are the parts of a personal computer, the connections between Input and Output of the hardware, application usages base on operating system which are included in Software, the brain of a computer or CPU which can work millions of jobs within a second, and the process of Hard Disk and RAM. All in all, I have started learning from typing and Microsoft Word in practical way. In the future, I am going to apply what I have learnt in my class to my learning Center and will also share back to my students. I am Ma Thandar who is eager to study English in a class. It has been a long time already that I wish I could study English but I didn’t have a chance like now. The reason was my day off is every Tuesday instead of Sunday and I was not allowed to take day off on Sunday by the factory which I have been working for. Fortunately, the factory has made a day off to everyone on Sunday and I was very happy. I was happier than others because it was the same time which the English class was started. After I have joined the class for 3 months, I am in a bad fortune again because the factory announced again that there is no more day off every Sunday. So, I asked permission to take a day off on Sunday to my leader but the leader has not given a specific answer yet. Despite the challenges, I have decided to study until the end. The reasons I am joining the class are firstly, to be a successful person in my future and secondly, some of my colleagues used to look down on me as an illiterate person. Finally, I want to receive a course completed certificate. The English class is quite useful for me. I have been learning new vocabularies in my class. I was a shy person before but now I am confident and believe in myself. Before, I thought I was not good but after I joined my English class my mind has changed. I become a person who has confidence and courage to stay strong for the rest of my life. I wish I could study in online diploma course from ACU (Australian Catholic University). That’s my dream but I don’t know where and how to start and get in the course. At least now I have started with Basic English class. Finally, I would like to thanks to all teachers and people who have been supporting this program to happen. As we reach the end of the year we share our achievements and thanks to all our Friends and Supporters. We hope you enjoy seeing the joy in the smiles of the students. The hope in the eyes of our young graduates. The love your support has given and grown here in the Burmese Migrant Community of Ranong. Download: 2018 Marist Asia Foundation Annual Report. Aye Chan May is 17 years old. She is an orphan. Both her parents died with AIDS-related death when she was 3 years old. Her aunt looked after her but needed to go to another province for work. The aunt asked her neighbour to look after the child and promised that she would send money for support. They never heard from the aunt after she left Ranong. The family had a difficulty to continue to look after and support her. Aye Chan May got sick and was infected with TB. She tested positive with HIV. The family was not able to look after her very well. She was not cared for and her health got worse. Ma Aye, one of our patients, found her suffering and needing much care and the love of a mother. She felt concern and pity on her so she took her home and adopted her as her own child. She cared for her, supported her and raised her as part of her family. She sent her to study at Thai school. 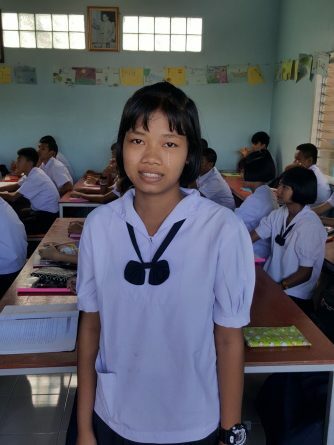 It had been very difficult for Aye Chan May to be discriminated even by her classmates at school. They even made fun of her and called her ‘HIV girl’. The foster mother consoled her and encouraged her to be just strong and not to be discouraged. Ma Aye approached the Marist Health Team at the hospital and introduced Aye Chan May to the team. The health team went for a regular visit, gave nutrition support and made follow-up for their medication and treatment. Aye Chan May got better and became more confident as she grew up. They felt that they were emotionally supported by the Marist health team. They had been stigmatized and discriminated by neighbours. The foster mother became more involved with the Self-Help group organized by the Marist health team every month. Both of them seemed happy and stronger as a family. However, another test came to their lives. Aye Chan May grew up as teenager. It was getting difficult for the foster mother to discipline her. Aye Chan May became more uncontrollable. It became a struggle in the family. Aye Chan May went away, left her foster mother and followed the aunt to another province to find some work. The foster mother and the health team had lost her contact. Aye Chan May did not get on with the aunt and she went away with her boyfriend in another province. She could not come for her regular medical appointment. They were worried and concern about her well-being and safety. After one year, she was able to contact one of our staff through social networking. She was able to connect with us secretly and able to ask for help. Sadly what had happened ws that she was locked up by the family of her boyfriend who made her a slave. She worked the whole day and night without pay, she could not go out from the workplace. She had been a victim of human trafficking. The Marist health team was able to rescue her with the help of the Thai Immigration Police and Catholic Social Action. Aye Chan May came back safely to her foster mother. The foster mother received her with back with much gratefulness and joy. The lost adopted daughter had reconciled again with her foster mother who was waiting for her to come back. Aye Chan May was lost but now found. She was able to gain back her health. She was reconciled again with her foster mother. She felt and realized that she is accepted and she is loved. She is now safe back in Myanmar. 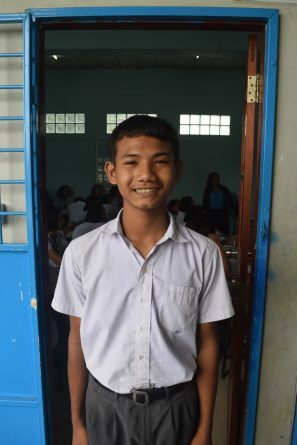 Hello, my name is Wai Yan Naing, I am 16 years old and I am studying year 4 at MAF. I was born in Thailand and I moved to Myanmar when I was 5 years old, I studied there till grade 3. Then my parents brought me back to Thailand to live on a rubber plantation where my family works. year. The year after that I sat the entrance test for MAF, when I came to sit the exam I was by myself and I had no friends or any lunch to eat. I was accepted into Year 1 and I was able to find transport to get to MAF. To come to school I need to wake up at 5am, the local bus comes to pick me up at 6am and then I need to get off and wait for the MAF school bus. I arrive at school at 8:40am and school starts at 8:45am. It is very busy, then I finish at 3:30pm and just like in the morning I need to take 2 buses to get home. When I get home I take a rest for 30 minutes then I begin to help my parents. On the weekdays I have to work on the rubber plantation until 12am, then I come back to sleep, but my older brother and father continue to work on the plantation. During class time I always feel sleepy and sometimes I fall asleep but my teachers always understand. My first two years at school I didn’t communicate much with the other students and didn’t have many friends. I was very shy and afraid to talk but now I’m friends with everyone at MAF. As year 4 are the oldest students, we have a responsibility to be the leaders of the school. In the morning my duty is a flag leader, this means I have to lead the school in raising the flag and singing the Thai national anthem. When it’s lunch time I go to the library and clean up the books or read. Usually only girls read books at lunch time so I make friends with a lot of them, they all call me brother, uncle, or grandfather because I was born with some grey hairs. At school I try and stay happy and make jokes with my friends even though I am always tired from working. My English teachers always asks “Are you okay Wai Yan Naing?” I often get sleepy. My ambition is to be educated as much as I can and earn a lot of money for my family, I want them to spend the rest of their life peaceful and happy. My biggest wish is that everyone is happy and always smiling, especially my friends. I don’t want anyone else to cry because of my mistakes or jokes. I hope that whoever is reading this has a smile on their face. My name is Aye Aye San, I am fifteen years old and I was born in Ranong, Thailand. I am in Year 2 of the MAF Burmese Migrant Secondary Education Programme. When my mother was 3 months pregnant with me my father passed away. After I was born my mother and I moved to a village in Dawei, Myanmar. After 7 years we moved back to Ranong and my mother began work in the fish factory and married my step father who was a fisherman. My mother has now retired because she has hurt her back and last month my step father developed stomach problems so he has had to stop working for now, we are worried because we are only living off my sister’s income. My older sister had hopes to get an education and become a teacher but she must work to support my family. She always encourages me to continue studying and working hard so I can have the future that she wanted. Sometimes my mother tells me to stop going to school and work to earn money instead, we have arguments because I don’t want to leave school and I get very upset. But my sister always believes in my education and works harder for income. My sister has told me if I focus and do well in my studies that she will try save up to buy a laptop for me. She knows how much it would help me in my school work and she wants to support my education. I attended Victoria Learning Centre from preschool to Grade 6, during this time I heard about Marist Asia Foundation and I wanted to join. This year I took the entrance test and was able to get in to Year 1, I was so happy to come to this school. This year I have realized my Thai and English language has improved so much and I think that is very important for my future. I now feel more confident to speak in these different languages to Thai and English speaking people. I have also loved doing practical things at Marist Asia Foundation and different kinds of learning. I feel like I have matured this year, I have learned how to have good relationships with myself and others. I have also learned a lot about my own culture too and have more respect for Burmese way. I hope to finish Year 4 at MAF and go onto the ACU programme, but I always worry that I will have to stop studying to work and earn money. I dream to be an air hostess when I finish studying but my mother wants me to be a business woman. If I am able to be an airhostess I think I will be so lucky and happy to travel and see different places around the world. Sometimes I feel sad but I always try to keep a smile on my face in front of others and try staying happy. I often worry about money and how my family will have enough to pay for rent, documents, school and food. But I am very grateful to go to school and I would like to say thank you to people who help our school. It is very different from my other school and there are lots of creative things to do. We can also watch videos and see pictures of history and different places on the TV. These things help me learn and I can have more fun while learning. Thank you. 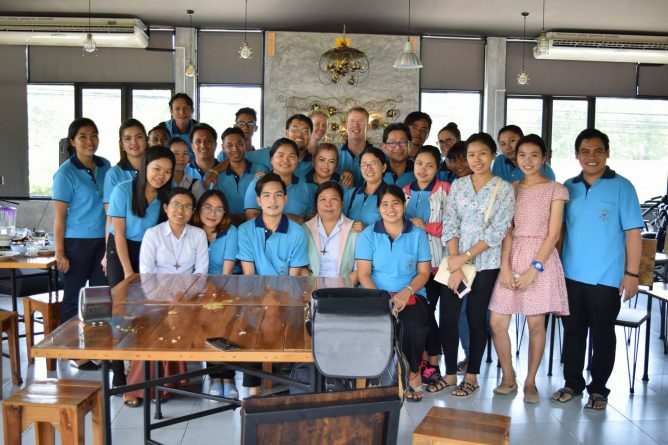 After 10 years of service in Ranong, on March 15, 2018 we said a special thank you and farewell to Fr Kevin for all his dedication and service as a Marist in supporting the Marist Mission in Ranong with Marist Asia Foundation. Here are his words shared at his farewell ceremony. Many thanks for this time and opportunity to say goodbye and express my deep gratitude to each one of you. 13 years ago the Marist community arrived in Ranong. 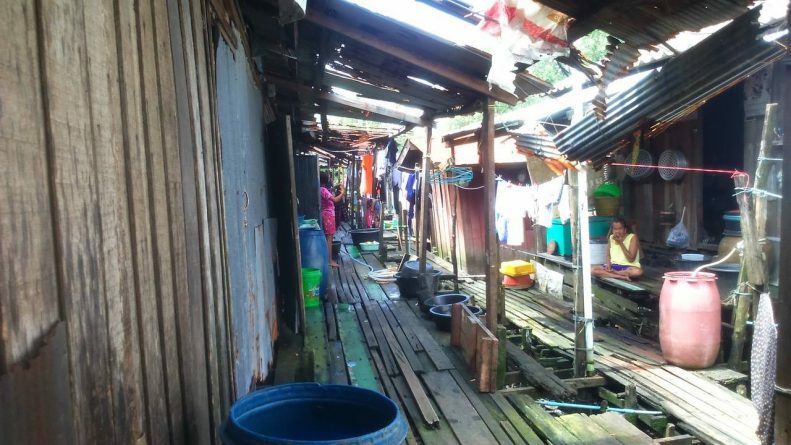 For the first few months the Marists did not do anything except try to listen to the needs and especially the hopes of the Myanmar migrants in Ranong. Two things emerged clearly; the great need for education and the needs of those living and dying with HIV-AIDS. There were plenty of needs and challenges but also a lot of hopes from children, mothers and fathers. In one parents’ meeting, a mother stood up and said. “I work very hard mainly cutting the head of the fish. I want my child to be educated. I him to work holding a pen and not holding a knife cutting the head of the fish”. One HIV-AIDS patient said to Fr John Larsen that without the Marist I am dead already 5 months ago. I have witnessed so many changes over the past 11 years. Our students have become our teachers and staff. 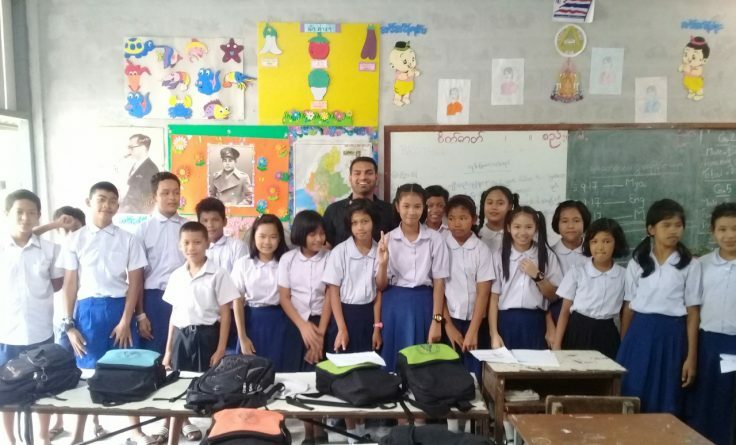 It is great to see our graduates being the young teachers in many different Learning Centres in Ranong. We are more confident to wear our uniform with Marist Asia Foundation on it. We are more confident to say I work with Marist Asia Foundation after the government has approved us as a Foundation. We have 38 ACU Online graduates serving different communities in Thailand and Myanmar. 7 or 8 years ago almost every two weeks, AIDS patients died. But it is very different now. The patients live longer and healthier. We don’t just sit and hope. We work very hard. Thank you for your hard work Education team and health team Admin team. All of us. I hope we will be more united, one heart and one mind as we continue responding to the needs of the vulnerable, marginalized and excluded in Ranong. I hope we will be a shining sign of Hope and Compassion. I have mixed feelings. I am sad to say goodbye to you and to Ranong. Ranong has been my home for 11 years. You are also my extended family for 11 years. We have many memories and stories we share. I am also happy to go. It is time to move on. It is time for me to start a new chapter my life. I am happy to go because I believe that MAF is in better shape and we have a more solid team. MAF will be a better organization, more effective and more efficient in responding to the needs of the migrants in Ranong and beyond. Many thanks everyone. Special thanks to the Marist Community and the RNDM sisters community. Special thanks also to our volunteers. This year I have had the privilege of being the tutor for the Australian Catholic University online Diploma programme in Ranong, Thailand. 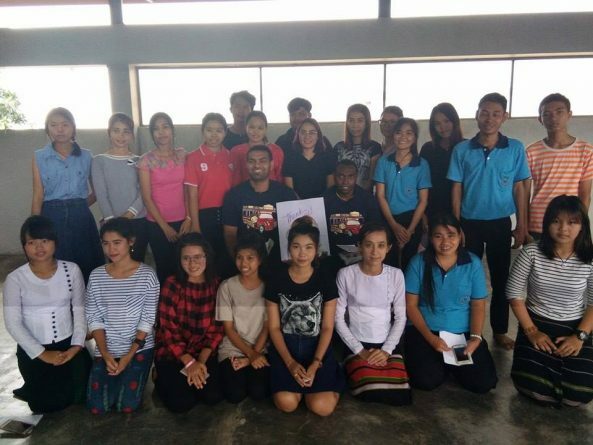 This programme provides tertiary level education for migrants on the Thai/Myanmar border in two locations: Ranong and Mae Sot. 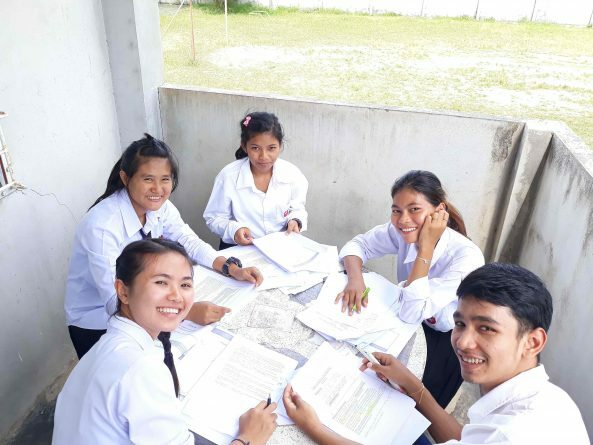 In Ranong, we have 16 students who will study everything from Management and Development Studies to Global History and World Health over an 18-month period. Most of the study is completed online with a tutor helping to ‘unpack’ the concepts and explain difficult vocabulary. Some courses also have a face-to-face component with lecturers travelling from Australia to spend time with the students. 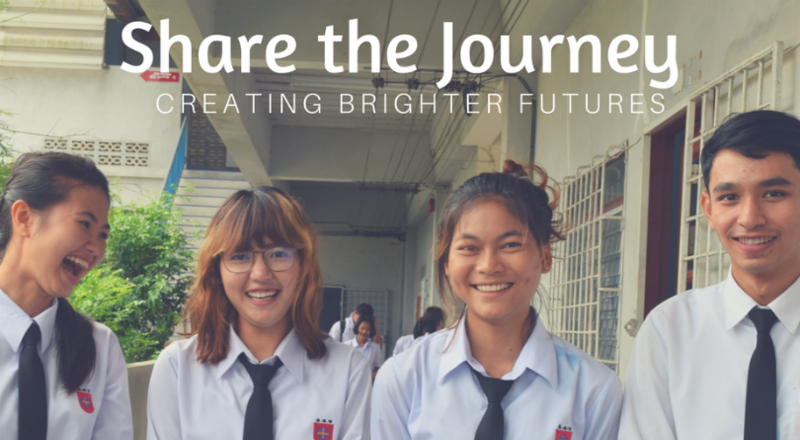 Most of our students have been through the BMSP secondary education programme at the Marist Asia Foundation. Their parents work in Ranong in a range of industries and work very hard so that their children can benefit from a good education. The students have already overcome many personal and family challenges to reach this level of study. So what’s it like, coming from New Zealand, to work with these students? Imagine working in a classroom full of engaged, smiling, friendly and fun, studious, and ‘ready to learn’ young people. And, like any good teaching experience, the learning is reciprocal. Not only am I learning about Myanmar language and culture, I’m learning about management, leadership, and resilience in the face of challenging situations. Our students are learning about ‘critical thinking’ or seeing different sides of a problem or situation. They are learning to ask questions and challenge the information presented in the course material. They are learning to think about the ‘pros and cons’ of each idea or theory and what their own response might be after reading the research. One week we watched a short film about the plight of the Rohingya people in Myanmar. This challenged them to think beyond their pre-conceived ideas about citizenship to the reality of peoples’ experience, but also that for every problem there are two or more sides to consider. This month we had a visit from a past student of the ACU programme. She now works at an international bank in Yangon, Myanmar and shared confidently in Burmese and English about her experiences after completing her studies. She stressed the importance of ‘life-long learning’ and shared about the competitive nature of the job-market in Myanmar. Her language and interpersonal skills (not just her academic record) had secured her a good job. That’s our hope for all our students then, that they will be ‘workplace’ ready with academic knowledge (competency), social skills (chemistry), and life skills (character). We also hope they will give back to their community in some way, either here in Thailand or in Myanmar and make the most of the opportunity they have been given. As for me, I’m enjoying this opportunity I have been given. Thank you Marist Asia Foundation and the Australian Catholic University for your commitment to this special project. Br Ben is a Marist Seminarian who came to Ranong on his pastoral experience placement while studying to be a Marist Priest in Rome. Marist Asia Foundation enjoys welcoming young Marists for their mission experience each year for 3 months. Below is Br Ben’s volunteer reflection. Before going out for a pastoral experience I always try to balance between getting to know something about the ministry so I know what to expect and at the same time not to have too many expectations as that can negatively affect the experience. I knew that Ranong was a mission run my Marists on the Thai- Myanmar border that started around 10 years ago and that there had been many Marists and volunteers from all over the world who had worked and are still working there. I knew that they looked after the needs of AIDS patients and that they had a school where they taught the Migrant children. I knew that teaching in a foreign country would have its challenges. Thailand had different education standards, curriculum and different pedagogies. But I soon realised that the main challenge is language. Teaching English to those who don’t speak it on a regular basis is a challenge as it demands a lot of patience, both from the teachers and the students. At times it was frustrating for me and the students, they wanted to learn and couldn’t and I wanted to teach but couldn’t. However, at the same time there were some “moments to remember” It was normally when the student or I made a mistake and the class had a giggle. It was normally me and this really strengthened our relationship as we were slowly letting out guard down and letting the other see us for who we really are. This allowed me to develop my relationship with the students outside the classroom as well. 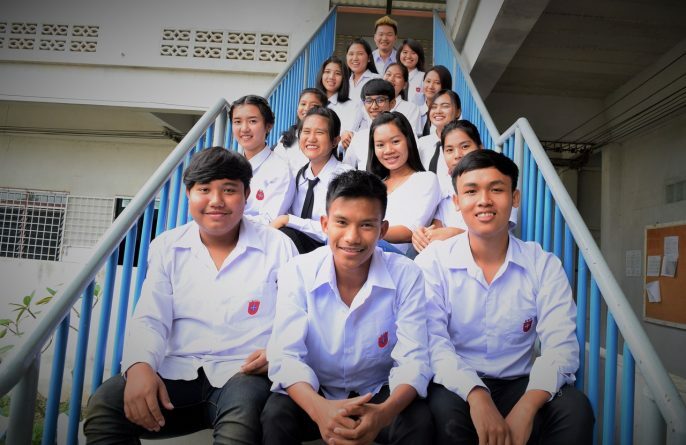 Playing volleyball with the students, talking to them in the hallways,, waving to them around the school and around Ranong helped to get rid of shyness and encourage them to speak freely both inside and outside the classroom . Working with the health team had its own set of challenges. Each patient had a different story of how they ended up in Ranong. Some were more heart wrenching than others but they all were victims of social and political injustice and had no means of changing their circumstances without outside help. This is where the Marist Asia Foundation Health team comes in and assists the patients with a variety of issues based on their needs. Some needed to get their documents in order before they could be helped by the local health system, while others needed extra health checks, not covered by the system. Others just needed a translator to communicate with the medical staff. A Marist finds strength in his relationship with God and his community. Ranong would have to be the youngest Marist community that I lived in to date. With a superior under 50 and all the other members under 50 as well it was a joyful and energetic community. This was strengthened by the community meditation prayer and mass every day. I’m grateful for my time in Ranong and for all that I learnt during my short stay. I had many experiences I will never forget and each of them will help a different aspect of my formation as a Marist. I will continue to pray for all those at the Marist Asia Foundation and pray that I see you soon. Kyar Phyu is living with her parents in Ranong. She lives among other Burmese Migrants not far from the Marist Centre. The road to her house is very rough and has many holes. The driver who picks her up everyday needs to drive carefully and slowly. She lives in a small house in the area of a charcoal warehouse. Kyar Phyu’s father works there. In the big warehouse area there are many houses for Burmese. Their homes are small and hot. Many Burmese rent very small rooms in Ranong. They are small with only one light in the middle of the house. There is only one bed room with all the members living together and they share expenses. In the family there are 5 people 2 adults and 3 children in small house. The house is dark and not clean. The family pay 1000 baht per month for their house but the income is only from her father. The mother looks after another 2 young babies, but she is not healthy. Her father doesn’t have a permanent job and depends on someones need. So the family frequently moves according to the father’s job. On the first day of school Kyar Phyu was happy and had a big smile, she always focuses on studying. She couldn’t hold the pencil properly but she tried really hard to write or draw to follow the teacher instructions. Everyday Kyar Phyu brings a lunch box but with very little food in it. Sometimes the food is not enough for her and the teachers watch her and will share food with her from her friends. It is a beautiful sight to see little children happy to share their lunchbox when they notice someone does not have enough food.